Traditional scrapple is polarizing. People who love it, really love it. And people who don’t, well, dry heave at the mere mention of it. The classic version, credited to the Pennsylvania Dutch, is made with off-cuts, trimmings, and offal of a pig—boiled, then chopped. Cornmeal and seasonings are stirred into the strained broth to create a mush, and the chopped bits and bobs are stirred back in. Chilled in a loaf pan until solid, it’s then cut into thick slabs, and at breakfast time, floured and fried in butter till crispy on the outside. Scrapple’s philosophy is essentially: waste not, want all. 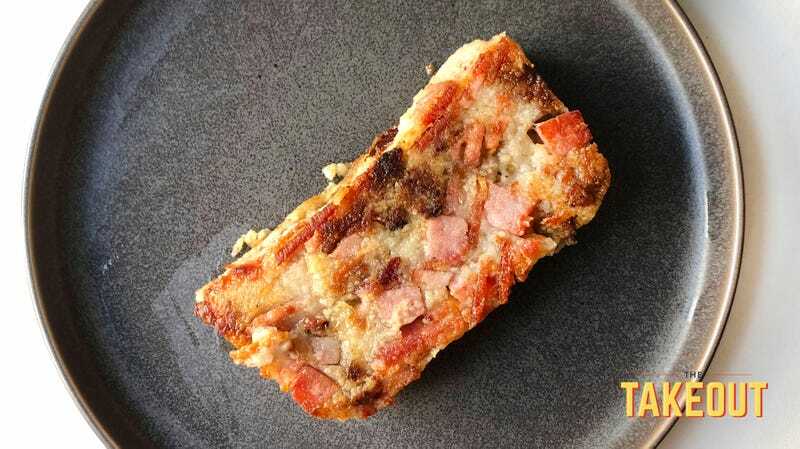 If you enjoy pâté, headcheese and the like, scrapple is right up your alley. But for many of us, the idea of a livery mush with bits of heart, tongue, and snout is not the best part of waking up. But the concept of porky bits of meat gently held in suspension in a sort of cornmeal batter and pan-fried to crispy isn’t something to let go of so easily! Enter: Breakfast meat scrapple. All your favorite morning side dishes in one. Cooked crumbled breakfast sausage, crispy bacon, cubed ham, and sliced Canadian bacon are all mixed with grits, chilled and sliced, and fried to a crackly crisp. You can eat it on its own with either hot sauce or maple syrup, or both, if you roll that way. Or use it as a sassy new accompaniment to runny eggs. It’s ideal as a brunch item, since you make it ahead and then just fry it up last minute. Conversely, if you have hosted a brunch with various meats and have leftovers, this is a great way to use them up! This recipe is very flexible, so feel free to use what you like, swapping in whatever you have around, using these amounts as a guideline. Prep a 9-by-5-inch loaf pan by lining with plastic wrap. Alternately, you can use a large baking sheet with a one-inch rim with cooking spray. In a large bowl, mix the chopped and crumbled meats until well-blended, since once you add the grits they tend to clump together. Stir the ground pepper into the grits until mixed through, and taste for seasoning. The meats are all salty, so you shouldn’t need to add extra salt to the grits. Stir the grits into the meat mixture until all the meat bits are coated in the grits, then transfer to either your loaf pan or sheet pan, and spread out evenly, pressing down to create a firm solid loaf. Chill at least six hours or overnight. If the mixture isn’t fully chilled it won’t slice evenly. In fact, you might even want to consider placing it into the freezer for 20-30 minutes before you slice. Once firm, slice into inch-thick slices (or cut into squares, if you used a sheet pan) and lightly flour each piece with the Wondra flour. In a large nonstick skillet, heat the butter and oil together over medium-high heat until shimmering and the butter has stopped foaming. Fry the slices in batches, about two minutes per side until golden browned and crispy and heated through. If you are serving a crowd, hold the cooked slices on a rack over a sheet pan in a 200-degree Fahrenheit oven. Serve hot, with hot sauce and maple syrup on the side. Oh, what the heck: add a fried egg too. How do you like them scrapple?